On December 26, 2004, the Indonesian province of Aceh was hit by the massive Indian Ocean tsunami that killed 170,000 people and devastated villages and towns. In the wake of the catastrophe, the Indonesian army and local separatist rebels, the Free Aceh Movement (GAM) ended their decades-long war, which took 15,000 lives. The peace agreement led to free elections, and international aid money began to flow, bringing new prosperity to this impoverished region. 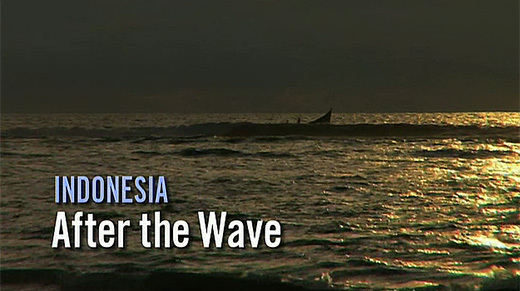 In “After the Wave”, I worked with Rainmedia, filmmaker Margarita Dragon and correspondent Orlando de Guzman, where he had first covered the war as a radio correspondent and journalist, to explore the prospects for continued peace. We revisited the village of Matamamplam, where in 2003, de Guzman filed a groundbreaking BBC radio report that implicated the Indonesian military in the execution of seven young men and boys. We meet with victims’ families and human rights workers now calling for justice, and he confronted the Indonesian general who was in charge of the province when the murders took place. “Everyone violated the human rights law,” the general tells de Guzman. “It wasn’t only Indonesia’s armed forces, the cops, the government, but the GAMs also violated the human rights law…. Do we want to keep talking about that? If we want to have peace, we have to bury everything.” De Guzman also meets Aceh’s new governor, Irwandi Yusuf, a former rebel leader who escaped from jail during the tsunami and now faces the task of redressing past grievances, without provoking the Indonesian army.